Everyone knows about the dangers of extensive sun damage. We all still want that sun-kissed look, but we want to get it safely. Fake tanning lets you get that golden glow without spending hours in the sun frazzling your skin. It lets you live your bronzed goddess dream, but you do have to watch out for the dreaded orange tone that can be associated with the sans-sun solution. 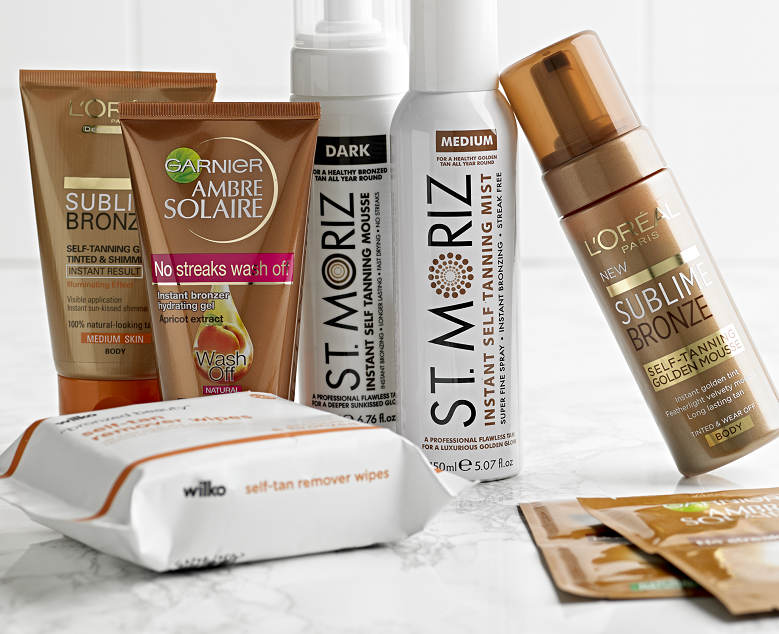 We have come up with top tips for making sure that you have the perfect streak-free fake tan all summer long. Preparing your skin properly for fake tan is one of the most important stages of the process. Moisturising regularly well in advance of putting on fake tan will make sure that it doesn’t stick to dry patches and stays even. For keeping your limbs looking lovely and feeling smooth, here are some of our favourite moisturisers. Firstly there is the Wilko Fruits coconut and vanilla body butter (£1.50) with a delicious scent of tropical coconut. It also comes in lemon and black pepper as well as 6 other scents. Click here to see them all. If you have a need for speed when it comes to moisturising, then the Vaseline Aero Moisturiser (£4) is perfect for you. It’s a spray that meaning you can apply it quickly, and before you know it you’ll be ready to go. It also leaves no greasy residue. Top tip: Before you actually apply the tan, make sure you are fully moisturised, but do let it sink in for a while before you slather the tan on. Exfoliating is another key step to getting gorgeously glowing skin; we love the St Ives Apricot Body Scrub (£5) and the Kiss Exfoliating Body Scrub (£4). Just scoop or squirt a small amount on to your hand and scrub in a swirling motion, be sure to not scrub too hard to cause irritation. If you are fake tanning your face as well you should use a light exfoliator. Try the Skin Therapy Gentle and Sensitive facial exfoliator (£2). It’s made with aloe vera and bisabolol and doesn’t have any colours, alcohol or fragrances, making it suitable for even the most delicate skin. Getting the dreaded orange hands after fake tanning is easily avoidable if you use a mitt or latex gloves. This St Moriz applicator mitt (£3) is the best way to keep away from orange hands. Just be sure to work your way up when you apply the fake tan to ensure you don’t get any creases, so start at your feet. Top tip: To keep your hands tanned and natural looking, just apply a light sweep of the mitt over each hand in turn and wipe over your nails to make sure it doesn’t discolour your nail beds or polish. One of our favourite fake tan types is the spray as it is quick and easy, the Garnier Ambre Solaire No Streaks Bronzer (£9.99) activates after just 3 hours and because it’s a spray it dries super-fast and gives a gorgeously even colour. There are also mousses and lotions which are great for long-lasting and instant tanning. So there you have it, a wealth of tanning knowledge to make sure you get the best fake tan possible without looking like a cheesy snack!